A classical violin is a marvellous work of art. Given its very modest size, the power, projection and quality of its sound is astonishing. Understandably, the violin has become a key instrument in Western classical music, as well as in many varieties of folk music and jazz. The history of what we know today as a violin starts in the early 16th century. Between the 16th and 18th centuries, superb instruments were produced by legendary luthiers like the Stradivari, Guarneri and Amati families in Italy or Jacob Stainer in Austria, among others. The parts of a classical violin are made from different types of wood, and their choice, shape, treatment, finish, varnish, etc., all have a strong influence on the acoustic characteristics of the instrument. As a consequence, the possibility of modifying the design to suit a specific player is very limited. Electric violins need not be made of wood or have a specific shape, since their sound is generally not dependent on the acoustic characteristics of the instrument’s construction, but relies on an electronic pickup, amplifier and speaker. 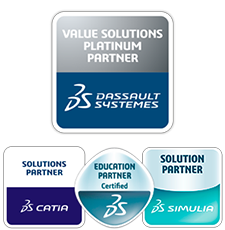 In this situation, the latitude of the designer is considerably wider and opens a range of possibilities for collaborative platforms such 3DEXPERIENCE. This allows, on the one hand, customising the design to suit a specific performer and, using the collaborative platform and the possibilities of 3D printing, to generalise its application to a scale that would be otherwise unthinkable. This is the case of Laurent Bernadac, who manufactures the 3Dvarius, the first electric violin that is 3D-printed in one piece. CATIA was key to the developments that made possible the construction of this high-end violin. Or that of SYOS, a start-up producing mouthpieces for saxophones. They have developed an algorithm able to link the description that a musician makes of his ideal sound with a mouthpiece geometry that is optimised to produce it. 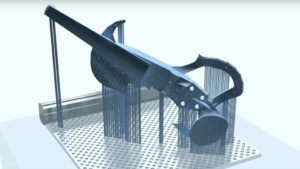 The 3DEXPERIENCE platform makes it possible to automate and optimise a parametrisation guided by the individual priorities of each musician, and to integrate in a collaborative environment all activities from the initial design all the way to industrial production. The result is musical instruments, or parts of instruments, that are unique, customized, simply produced, and affordable. A dream, not long ago.